Well, let’s rectify that, shall we? First, we’ll have an overview of just what makes electric-motor vehicle performance special, and then we will compare the top 20 plug-in vehicles in terms of horsepower, torque, and 0 to 60 mph times. As those who have driven an electric vehicle know, the way they behave is significantly different from how gas vehicles behave. Of course, the controls are the same, but when you step on the “go” pedal, you are immediately struck with the biggest difference: instant torque. Normally, when stepping on the pedal in a gas vehicle, there is a certain amount of lag time and power ramp-up before the engine pushes with its full strength, due to the lag between more gas being injected into the motor, it being ignited, and pushing power to the wheels. In an electric vehicle, there is no lag, because that power comes immediately and electrically from a drive unit. 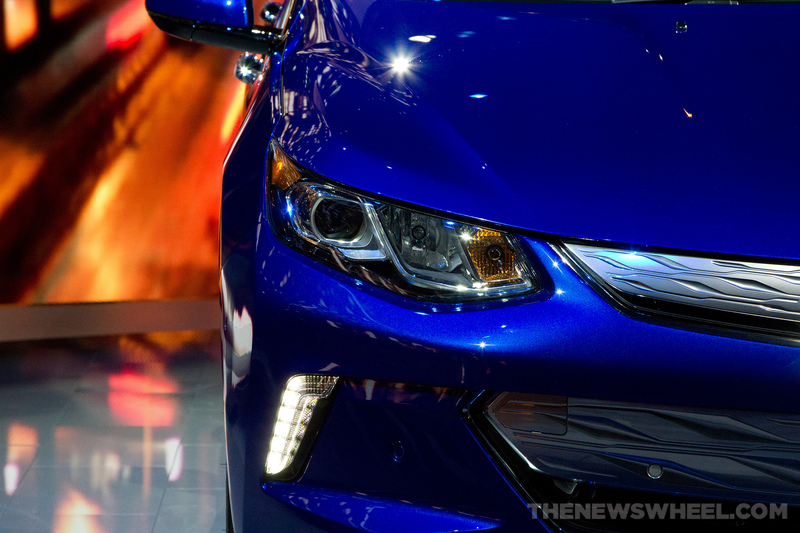 The second difference becomes apparent very shortly thereafter—electric vehicles are very smooth. Whether or not it is acknowledged, combustion engines often subtly vibrate the vehicle and can almost always be heard while driving. In an electric (or plug-in hybrid on electric power), there is no vibration and no engine noise—just a ride a smooth as the pavement and tire noise. 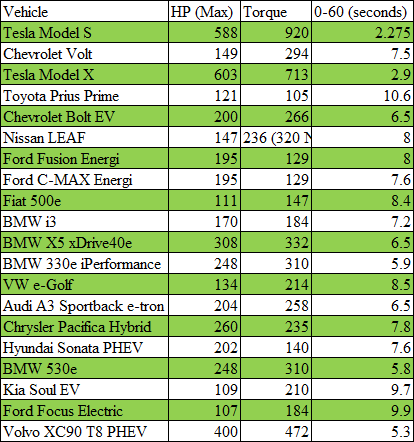 First off, here are the top-selling fully-electric and plug-in hybrid vehicles, according to InsideEVs—conventional hybrids are excluded from this because they use their gas engines full-time, while plug-in hybrids can operate, at least for a short distance, fully on electric power. We can pretty much see that sales volume are a bit of a mixed bag, with top billing going to the most geographically widely sold models—the Tesla Model X and Model S, the Chevy Bolt and Volt, the Toyota Prius Prime, and Nissan LEAF. 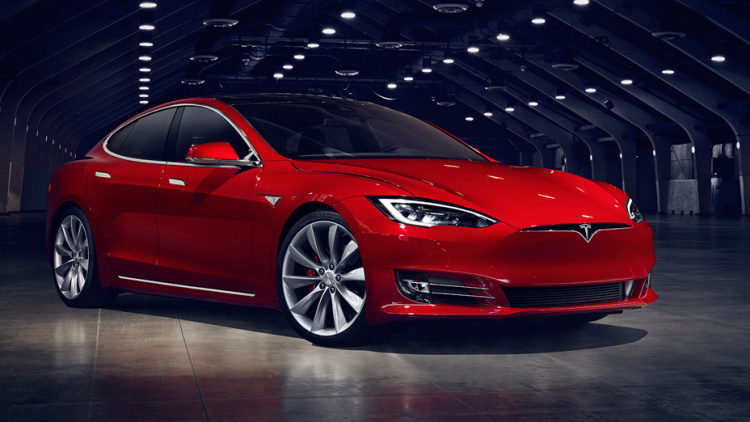 Four of the top six are definitely more mass-market-priced vehicles, with the super-cool luxury Model S and Model X rounding out the top sellers. 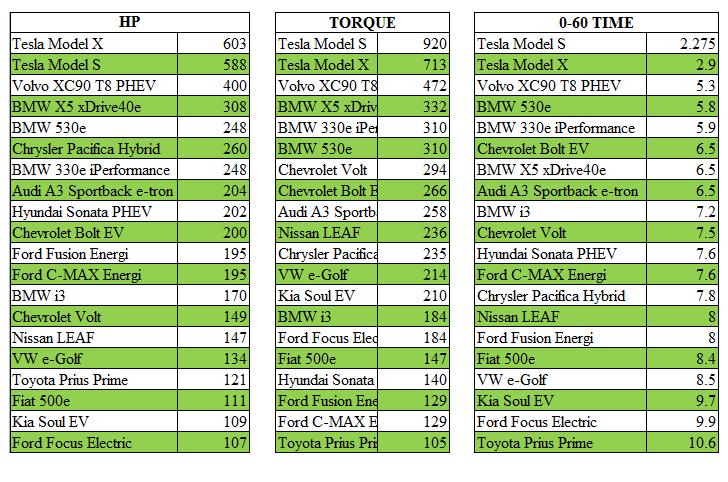 Here are those same top models, compared for maximum horsepower and torque, and lowest 0 to 60 mph time. Overall, I think we can pull a few conclusions from all this. First of all, from the research side, that complaint I mentioned at the top about not wanted to talk about performance is definitely valid. The web pages for most of these models focused a large part of their space on range, and most were not at all forthcoming on engine numbers (save for BMW). Many, if they did mention them, often just listed the total system horsepower and ignored the torque which gives plug-in vehicles their recognizable driving feel. 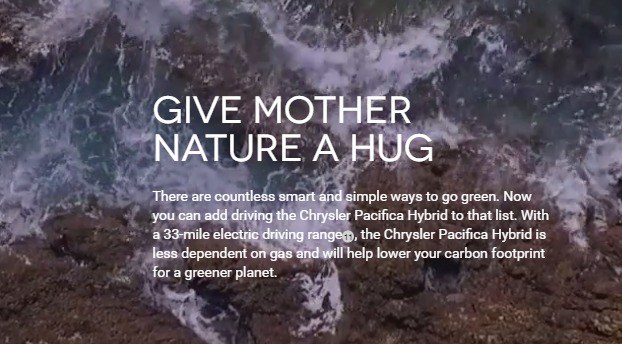 All in all, there was endless talk about range and charging, and a lot of nature-centric platitudes. Next, it turns out that when it comes to electrified performance, money can definitely get you there. 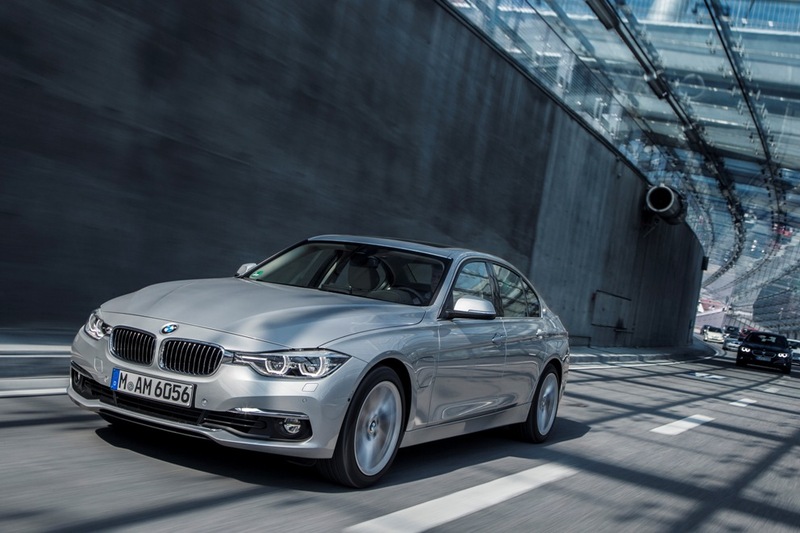 Top spots on each list go to the very high-priced luxury models, with the top five all coming from luxury brands—the thriftiest of the pack is number five on the 0-60 mph list, the BMW 330e iPerformance, which starts at an MSRP of $45,600. However, that doesn’t mean that a spirited electric vehicle is out of reach. There doesn’t seem to be much research around about just what an average car’s 0 to 60 mph time is (probably because it changes so often), but after browsing around, the general consensus is that greater than 10 seconds is slow, somewhere between that and 7 seconds is about normal, and below that is quick. With that in mind, a great number of our plug-ins offer at least a normal driving performance, with most of the list hugging close to the 7-second mark or lower. 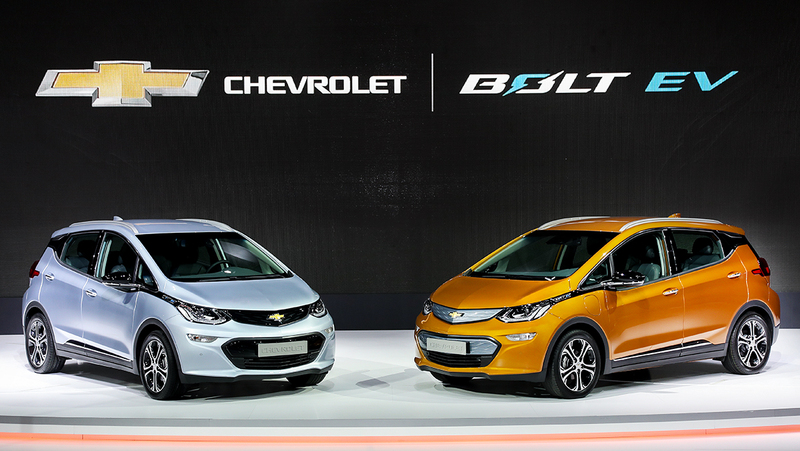 Interestingly, the least expensive fully-electric vehicle on the whole list, the Chevy Bolt EV, comes in as the quickest non-premium vehicle with a smile-worthy 6.5-second 0-60 time. Even if the more affordable models on the list fall mostly in the “normal” range, though, if I learned anything from driving around a Chevy Volt for a while (I got the chance to borrow the same one I wrote up a short review on last year), driving a plug-in vehicle is sure to bring you plenty of smiles, regardless of any list of numbers.